Permission is granted to copy, distribute and/or modify this document under the terms of the GNU Free Documentation License, Version 1.2 or any later version published by the Free Software Foundation; with no Invariant Sections, no Front-Cover Texts, and no Back-Cover Texts. A copy of the license is available from the Free Software Foundation ( http://www.gnu.org ). 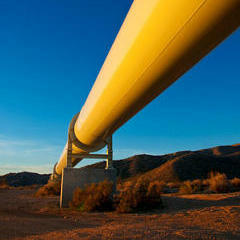 Inptools provides functionality to process EPANET INP files in various ways. Inptools is available from epanet.de/inptools . This manual describes Inptools version 2.0.12.1. Explorer integration for inp2shp. Use the Explorer context menu to generate Shapefiles from INP files. Several inp2shp bugs were fixed. First three digits of the version number now match version number of EPANET version included in Windows installer. Fixed bug in CSV file generation: Link CSV file was named "node.csv" by default. EPANET 2.0.0.12 along with the documentation were added to the Windows installer. The Windows version requires Windows 7 or higher. Improved Windows explorer integration. Double click on *.net and *.inp files opens them in epanet2w. The inp2shp tool was added. New functions have been added to the Windows Explorer context menu: "Create CSV file", "Create binary result file", "Help"
The epanet2csv tool was added. Linux or Windows (7, 8, 8.1 or higher) are required in order to use the Inptools. .
Inptools 0.2.3 is the last version that supports earlier Windows versions. How to install Inptools on Windows. Download the installer from epanet.de/inptools and execute it. Download the RPM package from epanet.de/inptools and install it. Inptools can be used in Windows Explorer or from the commandline. Inptools adds a context menu to Windows Explorer that can be activated by right-clicking on *.inp files. To access Inptools, do the following: Open Windows Explorer. Navigate to an INP files. Right-click on the INP file. Choosen Inptools → Open with EPANET will open the selected INP file in epanet2w for interactive editing. This option is only available if EPANET is installed. Choosing Inptools → Create report in German will create a hydraulic analysis report in German language from the selected INP file. Choosing Inptools → Project from GK3 to WGS84 will convert (projects) the selected INP file with Gauß-Krüger coordinates (GK3) into a new INP file with geographic (WGS84) coordinates. Choosing Inptools → Create CSV result files will create two CSV files with hydraulic analysis results. One file will contain node results and the other will contain link results. When generating CSV files, make sure that you use different file names for nodes and links. Choosing Inptools → Create binary result file will create a hydraulic analysis report along with a binary result file. This file can be further processed e.g. with the commandline tool epanet2csv. Choosing Inptools → Create Shapefiles will create several shapefiles (junctions, pipes, pumps, tanks, reservoirs and valves) from the selected INP file. The generated Shapefiles can be used in GIS Software like QGIS (Have a look at the GHydraulics plugin, if you use QGIS.). The inptools package contains several commandline tools. The use of the commandline tools is optional for Windows users. If you are not familiar with commandline interfaces, please stick to the Windows Explorer context menu ( the section called “Windows Explorer Integration” ). Binary result files can be created e.g. using epanet2d or epanet2l (the section called “epanet2d”, the section called “epanet2l”). epanet2d is part of the standard EPANET distribution. It's documented here because it's part of the Windows Inptools package and one option to create a binary result file that can be processed by epanet2csv. The binaryresultfile parameter is optional. Provide a path or filename in order to create a binary result file. 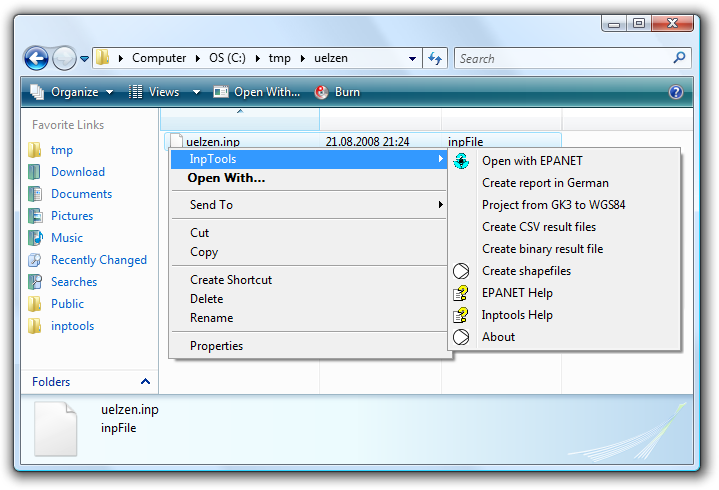 epanet2l is a modified (localized) version of epanet2d that allows to generate report files in German. The LANG environment variable can be used to determine in which language the command should operate (E.g. "en" or "de"). The inp2shp command converts an INP file into a set of shapefiles. Most of the source code is plain C and should compile with virtually any C compiler. in order to build and install. The epanet2csv command does not have any external depencendies. The inpproj command depends on the EPANET toolkit and PROJ.4 libraries. Please add the respective header files to your include path and link against the libraries. The C++ code can be compiled using MinGW. Update the version number in configure.in, installer/win32/inptools-setup.nsi, doc/de/inptools.xml, the MSVC project and doc/en/inptools.xml. Inptools - Tools to work with EPANET INP files. The inp2shp and shp2inp commands use shapelib under the terms of the LGPL. The inpproj command use the PROJ.4 cartographic projections library. Several Inptools commands use gettext under the terms of the LGPL.